I thought I would share where I am at with my Pan That Palette for 2017. I am focusing on finishing up the Tarte Be Mattenificent palette that I started in January of 2016. 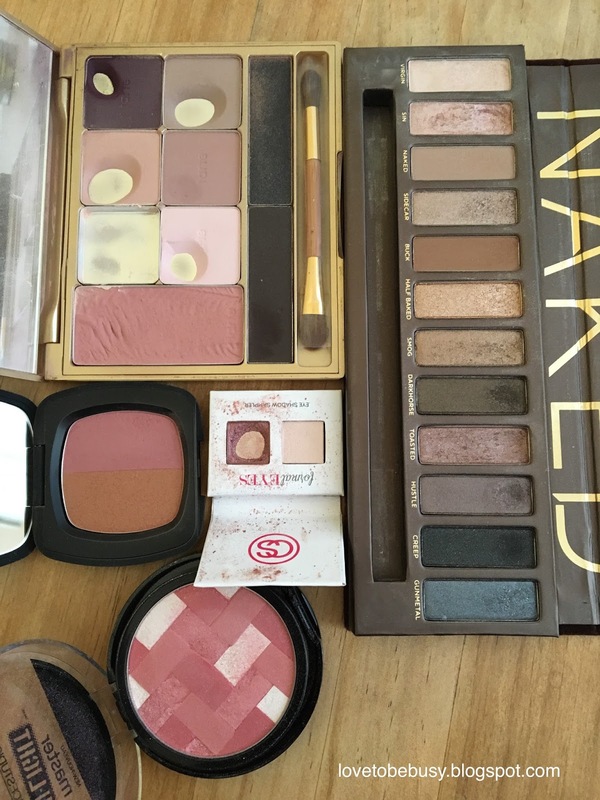 In addition, I am trying to use my Naked palette often since it is the oldest palette I own. Other shadows are being added in as well, especially if I am close to finishing them up or want some variety. I am also picking two blushes each month to rotate through and work on. I have some blushes I have never worn so I am also decluttering as I go if it isn't something I want to keep. 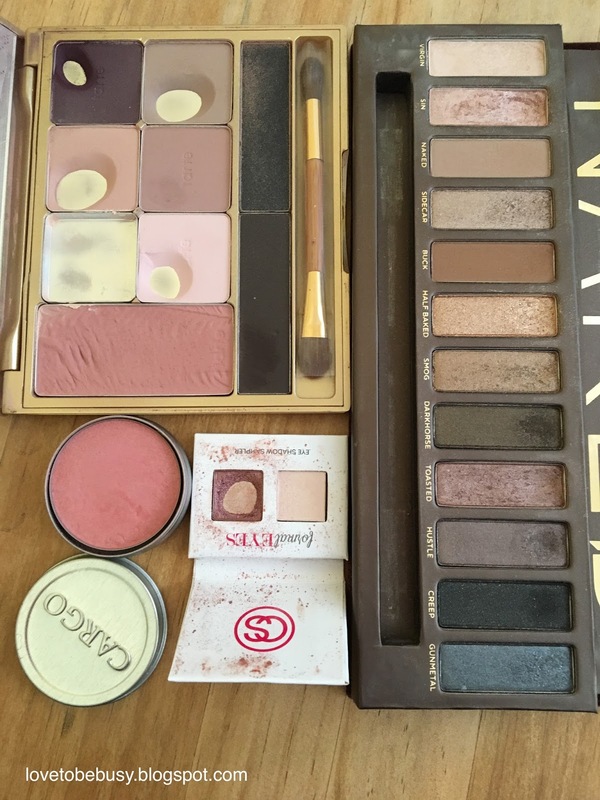 The top left is the Tarte palette. The cream shade was finished at the end of 2016. I had large dips in the other two shades I use as transitions. I use the dark purple as my lower lash liner and the light pink as a brow bone and inner corner. Because these shades are matte and neutral, I am able to mix up the look with other shades in my crease and on my lid. This past month, I used the Coastal Scents Style Eyes dark pink shade (the small duo) as my crease shade. I then used Sin from the Naked palette on my lid. The other look I wore often was the Tarte palette as my crease and transition and then Half Baked from the Naked palette all over the lid and up into the crease a bit. 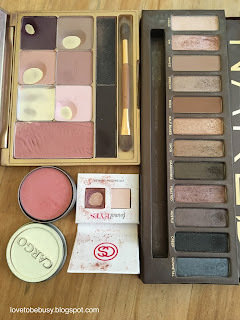 For blush, I used the blush in the Tarte palette and the Cargo blush in Bali. I am decluttering the Cargo blush since I find it to be chunky and hard to blend. I have other blushes I love than to try to work with one that I don't. My palettes will not vary for March nor will I be adding in any other shades on most days. The Naked palette gives me quite a bit of variety to work with. I would really like to finish the shade in the Coastal Scents palette this month. I will also be using the cream shade as my base after primer. I had been using another shade in my Sweet on Project Panning seasonal challenge. But since that is finishing up, I will be using the cream shade instead so I can get this duo out of my collection. The blushes for this month will be Bare Minerals in The Secret's Out. The bronzer is in the shade Skinny Dip, which I may use a bit as well. I will also be using the Maybelline Master Hi-light blush in Pink Rose which is one of my favorite blushes ever! Not seeing as much progress as quickly as I had hoped. You can see some dips at the top of Sin and Half Baked that have gotten a bit deeper.